This smoothie approaches the holy grail of healthy recipes – the treat that is REALLY good for you. With 59% of your daily value of vitamin A, 26% of your daily value of calcium, and 6 % of your daily value of iron in ONE serving, how can you not try it? This is a Medjool date, vanilla, almond, and kale smoothie and I have to tell you that this may be one of my best smoothies yet. It was inspired by my friend Meredith’s obsession with a milkshake she had in Southern California where they grow dates. As a child, she would have a date, banana, and vanilla ice cream shake as a treat. Sound good? I don’t use ice cream. Instead, I used unsweetened vanilla almond milk (Almond Breeze) which has a nice flavor. All the sugar here is due to the dates which are quite sweet. Also, I tossed in some kale because I couldn’t help myself. You can’t taste it. If you haven’t tried Medjool dates then you are missing something. These are as close to caramel as you can get without opening a package of Rolos. The comparison to Rolos is ridiculous because these dates grow on trees and taste so much better. Medjool dates are bigger other date varieties and are softer and chewier. Natural Delights has come out with a Medjool Date snack pack that costs $1.99, can be tossed in your purse, and can be found here: Find Natural Delights. They have offered to giveaway 10 snack pack prizes to Snack Girl readers. Each prize includes: 2 Natural Delights Original Medjool Dates, 2 Natural Delights Pitted Medjool Dates, 2 Natural Delights Coconut Rolls, 2 Natural Delights Almond Rolls, and has a retail value of $25. To enter send a photo of your favorite snack and Snack Girl To The Rescue! somewhere in the background (it makes a good coaster) to date@snack-girl.com. 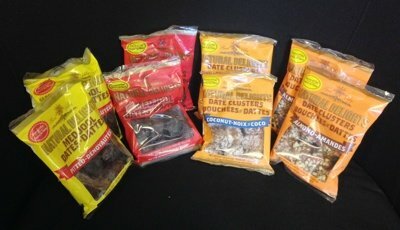 You do not have to use dates in your snack and contest is open only to residents of the USA and Canada (sorry Australia!). The entries will be judged by the wonderfulness of the snack (not the photo). I will be accepting photo entries until June 5th, 2014 and the top THREE entrees will be featured here on Snack Girl. The winners will be announced June 9th, 2014. Yes, you could become famous. If you haven’t purchased the book yet – here is another wonderful review A Breath of Fresh Air in the Diet Book Landscape. It is in bookstores and online here: Online Bookstores. Chop dates into small pieces. Add dates and ¼ cup vanilla almond milk to a blender and blend until dates are pureed. Add 1 ¼ cup vanilla almond milk and kale and blend until smooth. Serve over ice. May be stored in the fridge for later consumption. I LOVE dates! Have been snacking on them for the past few yrs. my favorite way? Dipped in peanut butter!! I LOVE dates and I especially love Medjool dates! This smoothie looks delicious - can't wait to try it. BTW - one of my favorite, easy & healthy snacks is walnut-stuffed Medjools! It's ridiculously easy - just remove the pit from a Medjool and replace it with half and a bit of walnut; press Medjool back together, and voila - instant, healthy and portable snack. Just two of these babies calm my hunger pangs and satisfy my sweets cravings. The problem with almond milk is that it hasn't much protein, so that if we substitute it for dairy or soy milk, we come up short there, don't we? It tastes good though. I read that kale is on the dirty dozen list, so the advice was to buy organic if you can. That is so disappointing, as the organic is not carried at my local grocery. Those dates are the BEST! Only because I now have relatives from the Mediterranean, have I discovered these 'sweets' you're featuring. More, please! Any other date ideas will be hungrily snapped up. Recently, I came across dried figs that look and taste like they've been candied, but it is just their natural sugar coming out, crystalised from a special drying process, which still leaves them soft. Evia, I think, is the brand, from Greece, but only available during their growing season; very frustrating not to get them all year long, I can assure you. Please try them if you can get a hold of them. Life-changing, real-food deserts. Far, far better (and better for you) than lollies and candy. I just bought myself a Vitamix so naturally I am OBSESSED with making smoothies right now so I will be checking out this recipe this weekend, thanks for sharing! My favorite way to sweeten my veggie smoothies is with dates. If you can't find organic kale at your local grocer, trying growing your own. It is very easy to grow and with just a few plants you can harvest quite a bit. This is a simple delicious smoothie. I love Snack Girl's fast, easy, and healthy recipes. I didn't have an apple fritter this morning! Being a fitness conscious woman, I always look for great healthy drink or food stuff. 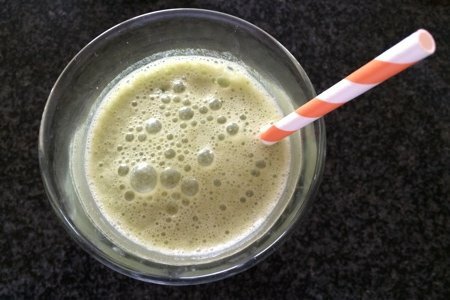 Its actually astonishing to know that a glass full of this smoothie contains 59% of our daily value of vitamin A, 26% of calcium, and 6 % of iron. I am going to try this smoothie for myself.